· Dorsal fur is variable in colour, from grey-black to russet brown. Ventral fur is nearly same with the dorsal fur, but slightly paler. 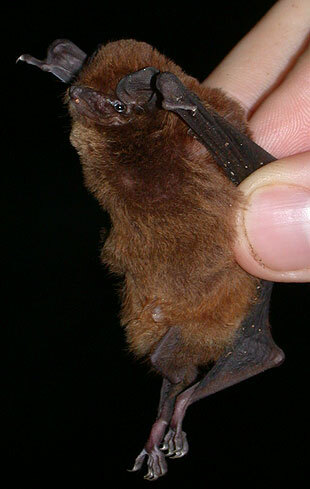 · This is a medium-sized vespertilionid bat. Forearm length 48.0-49.5mm (by our field survey in Guangdong and Guangxi). One bat in Yunnan had a forearm length of 51.8 mm (see below). 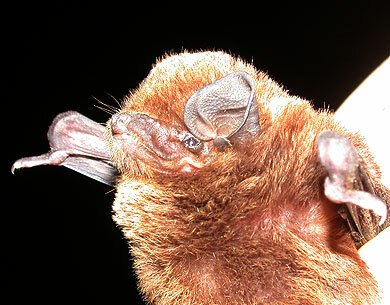 A bat from Yunnan that fell within the Asian clade sequenced and identified by Appleton et al. (2004) had a forearm length of 50.76 mm. · Each wing has a highly developed second phalanx of the third finger. · Body masses in Guangdong and Guangxi ranged between 12.0-15.6g. · Bats previously considered to be common long winged bats Miniopterus schreibersii are widely distributed from south-west Europe to Australia, but comprise a number of cryptic species (Appleton et al. 2004). The main phylogenetic divisions occur among Palaearctic, Ethiopian and Oriental-Australasian regions. A bat from Yunnan was a sister taxon to a bat from Japan, and embedded within the Oriental clade (Appleton et al. 2004). Tian et al. (2004) argued that within the Oriental-Australian region sequence divergence at cytochrome b was sufficient to recognise Oriental and Australian bats as distinct taxa. The results supported Maeda's recognition of Asian Miniopterus schreibersii as a distinct species, M. fuliginosus. A larger bat captured in Yunnan had a forearm length of 51.8mm, potentially fitting the size distribution for Miniopterus magnater, although the distinctiveness of this taxon is unclear. Probably widespread in Asia: certainly found in Japan. 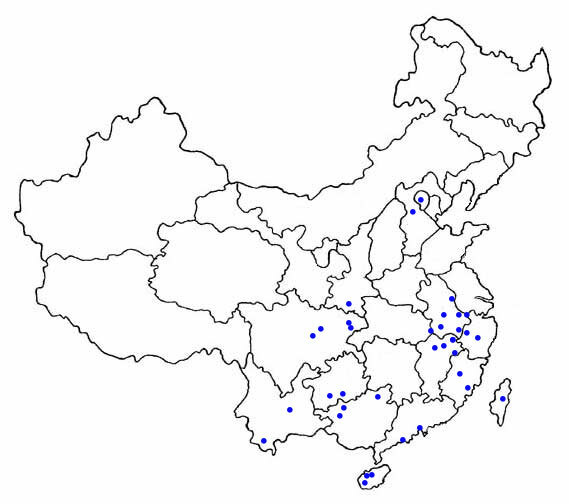 The Chinese distribution is shown by dots on the map (as given by Zhang et al. (1997). · Found in caves in Guangdong and Guangxi. · Narrow wings and a high wing loading and aspect ratio mean that this species flies rapidly and is not very manoeuvrable.
. 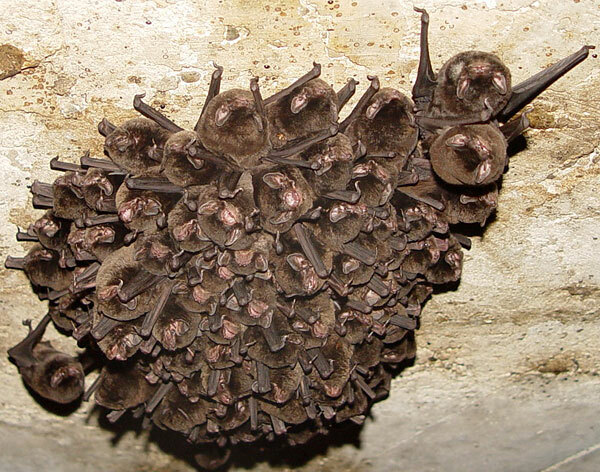 Bats recorded in Guangxi emitted broadband calls with an almost constant frequency tail. 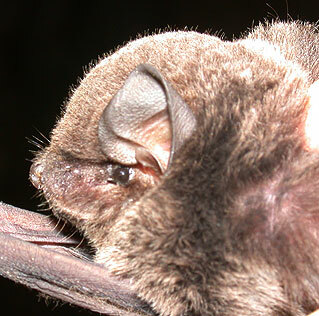 The frequency of most energy is in this tail, and ranged between 48.8 - 52.8 kHz (n = 5) for bats in Guangxi. This is slightly lower than the frequency of most energy recorded from M. schreibersii in Italy (54.2 kHz on average: Russo & Jones 2002). · There is no estimation of population size for China. · Long-winged bats M. schreibersii are widespread and probably not endangered on a global scale, although further research is needed to determine the ranges and abundance of the cryptic species present in this taxon. M. schreibersii is listed at LC (least concern), assessed by the Red List of Threatened Species (IUCN, 2006) and is not protected by the Law of the People's Republic of China on the Protection of Wildlife in 1989. M. fuliginosus appears to be widely distributed in Asia, and is probably not endangered. · Caves should be protected as their habitats.